I went into this book with no small amount of trepidation. The book description seems to imply that there’s a lot of angst in this story, and I’m in no mood for it at all. However, I’ve been following Jay Clark on social media for quite a while now and angst doesn’t seem to be his thing, so I decided to give this book a chance after all. I was right about the angst part, at least. While it’s true that Finding Mr. Brightside is blissfully free of angst, it’s also devoid of any sweetness. It’s a pretty claustrophobic little book that revolves around two characters, Juliette and Abram, with only two or three more secondary characters to lighten things up a bit. Juliette’s mother and Abram’s father were having an affair and they died together in a car accident. Juliette and Abram are both grieving in their own ways, but Juliette is having a much harder time getting over her anger. Abram didn’t strike me as angry. He didn’t strike me as anything, really, and I can’t say that his character stood out in any memorable way. As for Juliette, her behavior often made me very uncomfortable, and while I can forgive some of it because of her grief, she was sometime bossy and appallingly inconsiderate of others. Not something I want in my heroines. 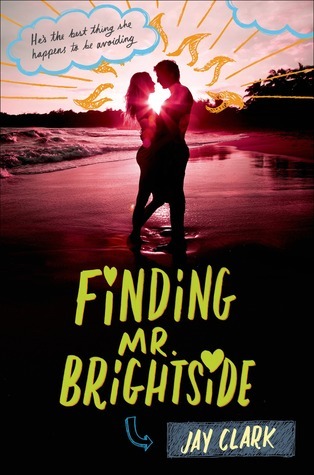 Finding Mr. Brightside tries too hard to be quirky and different, and while it succeeds with the latter, it falls considerably short with the former. I had high hopes for it, especially after reading the first few, very promising chapters. But after the initial humor, the rest mostly just fell flat, and I ended up struggling to finish this unusually short book. It’s pretty obvious that Jay Clark has a lot of talent, though, and I’m positive that he can and will show it. I don’t think he’s found his voice quite yet, but he’s getting there.I have high hopes for his next book. This sounds like an interesting book and what caught me was how similar the book cover is to Jennifer E Smith books. But not in the slightest bit in content. I am a bit picky when it comes to male writers too when it comes to romance, I think I find myself a biased reader sometimes and I don't find them to be as well constructed reads as others. So whilst it sounds like a good read, it seems to lack something too by the sound of your review. Great, honest review though. :) Sorry for the rant, lol. Aw, I'm so sorry this book ended up this way. :( I'm actually a fan of both angst AND sweetness, so obviously I'm disappointed that this book had neither. It does sound awfully dull. And the flat humor's making me think of the book I'm reading now, which is going in that direction for me as well. Lovely review! YAY for free of angst but I'm not particularly interested in reading a book that would feel claustrophobic... so thank you for your review, Maja, I'll be skipping this one! Maja! Hi! I had no idea you were back to blogging. My feed hasn't been showing me your posts, but I'll go read them over the weekend. Anyways, this sounded like a sweet book, but I waited to see what others thought of the book first and it looks like I was right to wait for it. The characters don't sound like they will mesh well with me, especially Juliette. I'm not sure if I would enjoy the atmosphere in the book if it's how you felt but in a whole it sounds ok. Sorry it wasn't more for you. But really sweet cover there! I'm glad I read your review, Maja, because I was considering this one. I don't think I will read it though... I can appreciate, as you have, the author's desire and perhaps effort in breaking the mold and creating something unforgettable, but I believe that to be a difficult road to walk unless guided by powerful vision and the experience to sustain it. Too much of a good thing and all that jazz... Thank you for a memorable review :) Have a delightful weekend! I definitely would have picked this up on my own (the cover so reminds me of Jennifer E. Smith's covers for her books!) but after reading your review, I actually think I will pass on this one. I really like these type of reads to be fun and stand out. I can handle emotion but books devoid of it when there should be some bother me. Wonderful honest review Maja! Have a fabulous weekend!! I was tempted to pick this up as I liked the quirkness of Jay's first book. I steered away because I was afraid of the angst. I am so disappointed that this one lacks Jay's witty sense of humor. Quirky can be good or bad I guess. It's too bad this wasn't more wow though. I hadn't even heard of it before now and I'm already burnt out on YA books so I'll skip it. Hm... other than that song that is now stuck in my head, I'm not sure this one is for me. I'm usually picky of my contemporaries and while low angst makes me happy, lack of quirky-ness is not good. Doesn't look like a bad book but probably not for me. Brilly review! That's quite disappointing. I've been a fan of Mr. Asher since reading The Edumacation of Jay Clark. And if followed the same style of writing with that book as is with Mr. BRightside, then I can see where your gripes are coming from. You are such a great reviewer. You really are! Sorry. Just wanted to let you know how much I enjoy reading your reviews. This one sounded like it could have been so cute. What a shame that it fell flat. "claustrophobic little book" is a really good description for books that focus almost exclusively on just two characters. Didn't think this book was for me but thanks for verifying! I'm all for an angst free read, but I do need some sweetness. I'm going to take a pass on this one as its not my cup of tea.